This is THE best tip for photography. A photograph is simply the capture of light and shadow. A talented photographer will know how to sculpt your face with lighting. However, we don't all get to have a trusted photographer for every event. I use this technique every time I think I'll be photographed, because I hate nothing more than the unflattering effect of straight-on flash. (Cringe). For photographs, avoid using shimmering highlighters. You'll just look sweaty. Yuck, right? 1) Select a foundation that is one shade darker and one shade lighter than your natural tone. I like these ones by Mac. 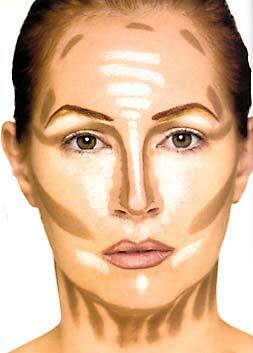 2) Apply the darker foundation in the pattern below from Kevyn Aucoin's book, Making Faces. 3) Apply the lighter foundation where you see the white marks. 4) Blend very very very well. 5) Apply your perfect colored sheer to medium coverage foundation over the top of it. Voila! Defined cheekbones, a slim nose, a stronger jawline and brighter eyes. Practice this before you debut it in public.